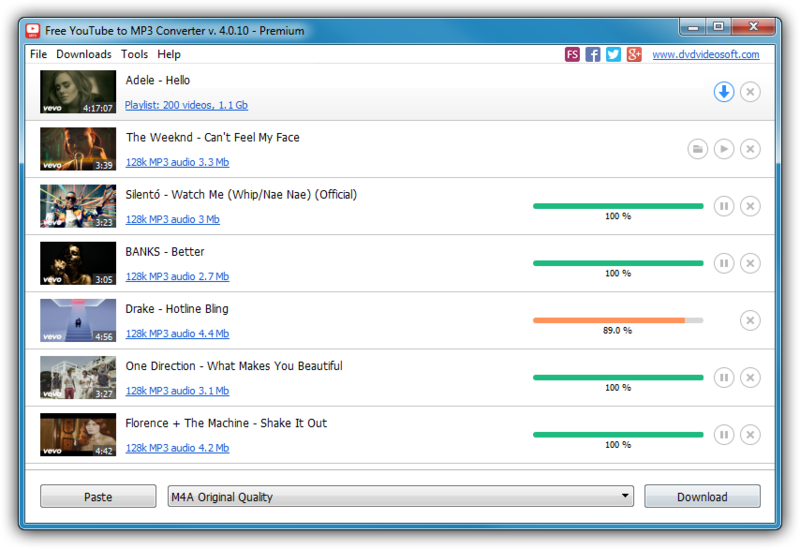 Free YouTube to MP3 Converter You can do so very easily with Free Youtube to MP3 Converter which as the name suggests, takes YouTube videos and saves them to your hard drive in MP3 format. After the Ask.com toolbar installation (uncheck all three boxes if you dont want the toolbar), its plain sailing. You can copy and paste links into the interface and queue them up for extraction. The extraction process is not the fastest I've ever seen in an app like this but it's not slow by any means. You can select from 4 presets up to 256Kbs which is a very high quality of conversion and ideal for those that need to use the clip for high quality editing. You can also add tags to your extractions to make them easier to find when you search for them on your desktop. - all videos from the user favorites. The output files are downloaded as MP3 (economy, standard, extreme and insane quality) or WAV (lossless audio) files into the program's folder in My Documents, and they retain the name of the source video.